Red Dates Tea Benefits and Functions. 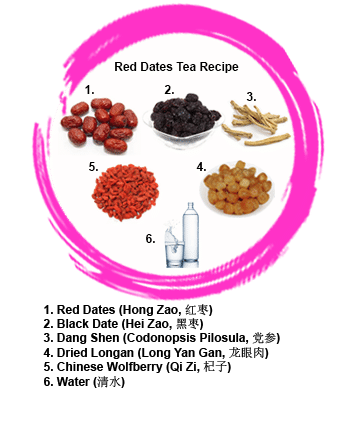 Red dates tea recipe for confinement can be used for general health care, not only for mums after childbirth who are not engaging confinement nanny. Red dates tea is an essential confinement drink recommended by TCM practitioners as mums are weakened generally after delivery. 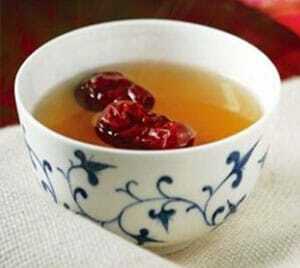 Red dates tea help improve Qi, boost blood circulation and immune system. Red date tea is usually included in confinement food menu when ordering from confinement food caterers. This is because women after delivery will suffer from swelling or water retention problem and will be advised to avoid water during confinement. As red dates provides many health benefits, red dates tea has been acknowledged to be a good replacement confinement drink for water. Often, other chinese herbs such as wolfberries, dang shen, black dates are added as well for the taste and additional health benefits. To DIY lovers, follow the following instructions on how to make red dates tea. Making red dates tea is simple. Only require to add all ingredients in a large slow cooker and simmer for 3 hours over low heat. Store the tea in a thermal jug and serve hot. If you have a small slow cooker, you can boil a concentrated amount and mix it with hot water every time when mum need to drink. Looking for Pre Packed Confinement Herbs List?